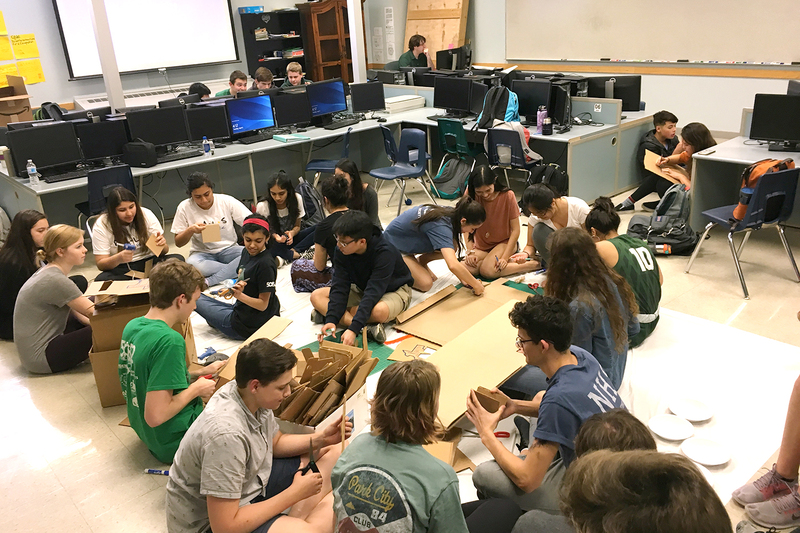 By cutting and gluing cardboard, and painting them green, students help make battery trash cans on April 3, 2018 in EIT. From serving as a health hazard to contaminating the environment, there are many ways that technology can negatively impact the world if disposed of incorrectly. Environmental Issues with Technology (EIT) was initiated last year by senior officers Justin Nita, Adri Karmakar and Grant Lee in hopes of educating people on the growing issues of technology, as well as encourage others to help make a positive impact on the environment through projects. Karmakar’s interest in forming the club began while reading an article about the hazardous impact technology has made on the oceans. One of EIT’s prominent service projects in 2018 was the EIT Battery Trash Can Project, where members and volunteers of EIT created trash cans in an assembly line style starting from cutting the cardboard, gluing the boxes and painting them green to tribute a green environment. These trash cans were distributed throughout the school, primarily to the math and science teachers, and served as a way to dispose of batteries effectively. 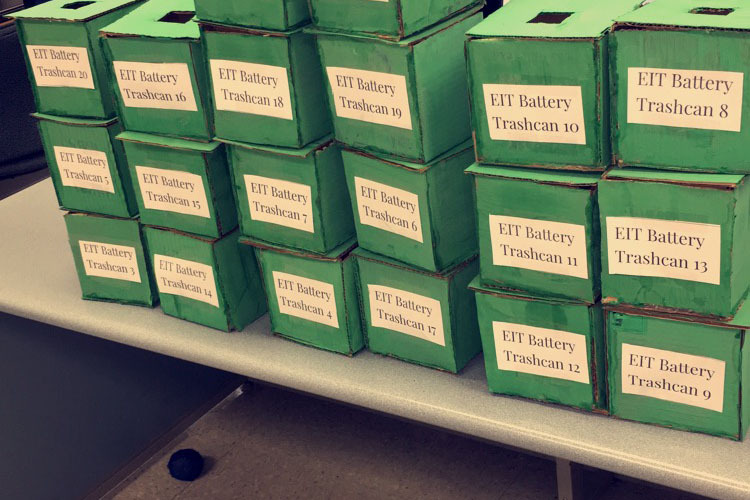 After the batteries are collected, EIT officers ensure that they are disposed of or recycled safely by giving them to companies like Batteries Plus Bulbs. 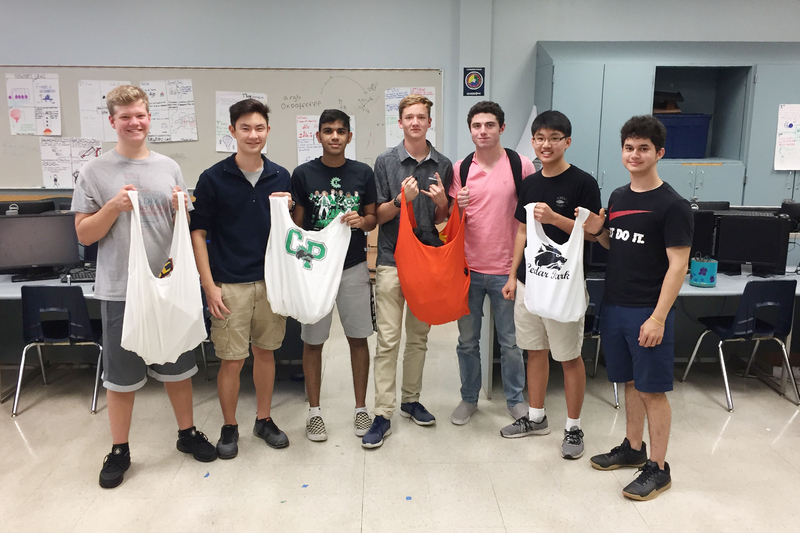 More recently, EIT members worked on a project to reduce plastic bag usage while shopping. Senior Matt Freeman has been a part of EIT since its first meeting back in 2017, and said that he likes being able to discuss and come up with plans to help the technological environment. Similarly, senior Mackenzie Martinez said that she loved the battery trash can project, but she especially enjoys the connections she has made in the club. Martinez said that the club is able to have fun while making a positive impact on the environment. In terms of this year, Nita said EIT plans to create birdhouses around the school to attract more wildlife. EIT meets on the first and third Tuesday of every month from 4-4:30 p.m. in Lab 5. Students can stay updated with their club projects and meetings by signing up for their Remind 101 by texting @eitcl to 81010. Nithila is a senior here at Cedar Park High School and this is her first year on The Wolfpack staff. 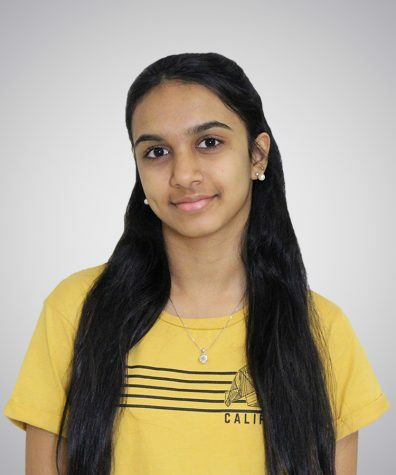 She is involved in multiple honor societies, and holds an officer position in DECA. She primarily enjoys writing articles that people will be able to relate to, or learn something from. Outside of school, she enjoys participating in productions by her dance school, and is currently working on becoming a student teacher there. She also loves playing with little kids while she volunteers at Thinkery Children's Museum. Finally, she hopes to study Architecture in college and will most definitely take her passion for writing along with her.